Water. No resource is more vital to the California’s prosperity or steeped in more controversy. Today, with drought conditions in much of the state, a $25 billion proposal to improve the ecosystem and water system in the San Joaquin Delta, and the largest water bond in history slated to go before voters in November. The stakes have never been higher for those who manage and depend on reliable water resources. 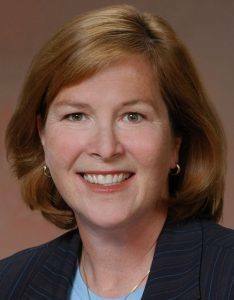 Susan Sims is the Executive Officer of the California Water Commission, and has more than 20 years of experience working on state water policy and other natural resources and environmental issues. She will offer her perspective on the current water conditions, challenges, and the opportunities for our water future. President Peggy welcomed all present to the FINEST Rotary Club in District 5130. Kevin Brown led us in the Pledge and Mike Kallhoff shared his invocation. Ann Gospe introduced our visiting Rotarians. Coming to us all the way from Bankok, Thailand was real estate man Daniel Wylie. Daniel considers Sonoma County home and visits quarterly – don’t be a stranger, Dan! Non-Profit Manager and Santa Rosa Rotary Club Past President Barbara Beedon was also in attendance day as a visitor from Sebastopol..
Today’s guests included prospective member Bart Eddy, a guest of Karen Ball, Cardinal Newman principal, Graham Rutherford and Greg and Liz Clark, parents of today’s student recognition recipient. Chuck Bartley, 1967 * Kathleen Archer, 2008 * Ray Foreaker, San Rafael Club, 1991 * Steve Olson, 1994 * Will “Aloha” Haymaker, 2002 * Barbara Beedon, 2003 * Norm Owen, 1996 and who also served as the District Governor in 2003 * Wally Lowry, 1991 * Yale Abrams, 2004 * Ray Dorfman, 2007 * Jeanne Levin, 1998 * Debi Zaft, 2006 * Rich de Lambert (who claimed he was president in 1988, but was really president in ’87) * “Just” Joel De Silva, 1999 * David Brown, 2000 and Don McMillan, 2010. There’s a new raffle in town and today it was going to pay a whopping $36. Doug Chase, presiding over the new raffle today, explained that the raffle contains only face cards, aces and jokers (Hey that could describe our club members!). The winning card is now the Queen of Diamonds. A $10 consolation prize was awarded this day. Bill Hatcher introduced Cardinal Newman principal Graham Rutherford to tell us a little about our CN representative. 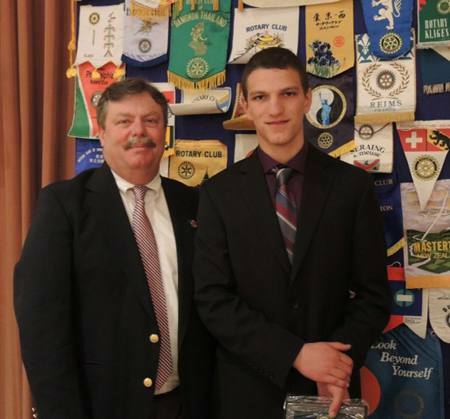 Michael Clark was recognized by Mr. Rutherford not just for his 4.2 GPA, or his participation in 4H, football, rugby or his exemplary community service, but for doing this all after receiving news that he had been diagnosed with cancer just before his senior year. The character shown by Michael is inspirational to all who have the privilege of knowing him. To his credit, Michael thanked the school, Mr. Rutherford and, of course, his parents for the support he has received during this difficult period. A fine young man, indeed! Debi Zaft presided over today’s Magazine question. The question was answered successfully by Steve Olson. Following the end of Kathleen Archer’s term as Chair of the Santa Rosa Salvation Army’s Advisory Board, Wayne Rowlands was elected to be the new president last week. Wayne has been an active member of Rotary since he became a Rotarian in December 2003 at the invitation of the late John Brown. An active Rotarian, Wayne has served on the Rotary Board and as Programs Chair for four years. He has been a major force in growing Rotary Means Business from a grass-roots organization to a Rotary International Fellowship and is the current Secretary and the Chief Webmaster of the international fellowship. Please join us in hearty congratulations to Wayne on behalf of our Rotary Club. President Peggy announced that Rotary International President Ron Burton will be speaking at an evening dinner event in Sacramento at the Double Tree Hotel on March 30th. See the article below for details. Our April 23rd meeting will be an evening meeting and mini fundraising social. The event will start at 6pm and dinner will be $25.00. There will be both live and silent auctions to bid on to raise money for our local and international programs. A memorial mass will be held on Friday, February 21st for Creed Wood, who passed away suddenly February 3rd. The service will be held at 11AM at St. Vincent Catholic Church , 35 Liberty St., Petaluma. 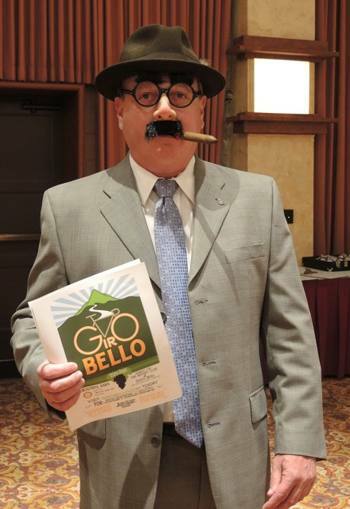 Showing that he will go to any lengths to get 100% participation in Giro Bello, Doug Johnson donned a large nose, a fake mustache and a hat to promote the event to the club membership, with help from Matt Everson and others. This is our club’s only large fundraiser this year and will require all hands on deck. There are many ways to get involved. If you want to participate but don’t know how you can help, contact Doug. We really need riders and sponsors! Help us make the 2014 Giro Bello the best fundraiser ever! Immediate Past President Bill Rousseau presided over today’s recognition of our past presidents. PP Bill asked the group of past presidents several questions about their Rotary service and how they were affected by being president of the club and also their experiences at Rotary International conventions. Debi Zaft joined (when her husband left and moved to New Mexico) as a way to meet new friends, who eventually became family to her. Ray Dorfman explained that the late Jack Levar, a golf buddy of Ray’s dragged him to a meeting as a way of meeting people to help him get over a recent divorce. This allowed Ray to meet “Roterbabes” and ultimately led to his marriage to the lovely Debra, who as we all know is wayyyyy out of Ray’s league. Norm Owen, who later went on to become our District Governor said he was introduced to Rotary by former Santa Rosan Gordon Shurtleff, now of La Jolla. Gordon was a very persuasive type as all who know him can attest. Norm said he stayed in Rotary because of the many opportunities for service it provides. The attraction for Kathleen Archer was the opportunity to serve internationally, which resulted in her working on a project that led her to Uganda. Don McMillan said it takes up to five years to prepare. Wally Lowry said that you really have to get to know your club to be an effective president. 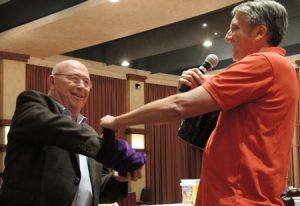 Ray Dorfman described the five days of intense training the incoming presidents receive at PETS (President Elect Training). David Brown said to have fun and embrace it. Others cited time management as an issue to be considered and being prepared. Will Haymaker shared a touching story of a small home built by Project Amigo in Colima, MX. A small child was gathering flowers to plant around her new, but very modest home. Years later, that child, aided in her school career by Project Amigo scholarships is now studying to be an orthopedic Surgeon. Rich de Lambert shared his story of a potentially muddy dance to celebrate the Windsor Balloon Races. Jeanne Levin, Wally Lowry and Norm Owen also shared touching and amusing stories of Rotary Projects they were involved in during their presidential years. 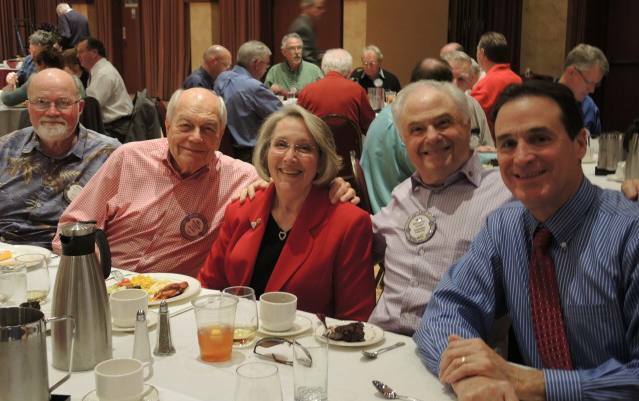 Our Rotary Past Presidents benefited greatly from the hard but satisfying work of being a club president. All agreed that you get out of Rotary what you put into it and that the hard work pays off in ways you never expect (Ask Ray). All the past presidents were able to visit exotic locations for Rotary International Conventions (except Ray, who went to Salt Lake City). Some of those locations were Bangkok, Barcelona, Buenos Aires, Osaka, Montreal and Sydney. Past President Bill then asked our presidents for any advice they could give to the membership, especially red badgers in getting the most out of Rotary. The overwhelming response was to GET INVOLVED. To see all the photos from this meeting, click here: Past Presidents Day Photo Gallery.